A file picture takenon February 8, 2014 shows Spanish Infanta Cristina smiling as she arrives at the courthouse of Palma de Mallorca, on the Spanish Balearic Island of Mallorca. 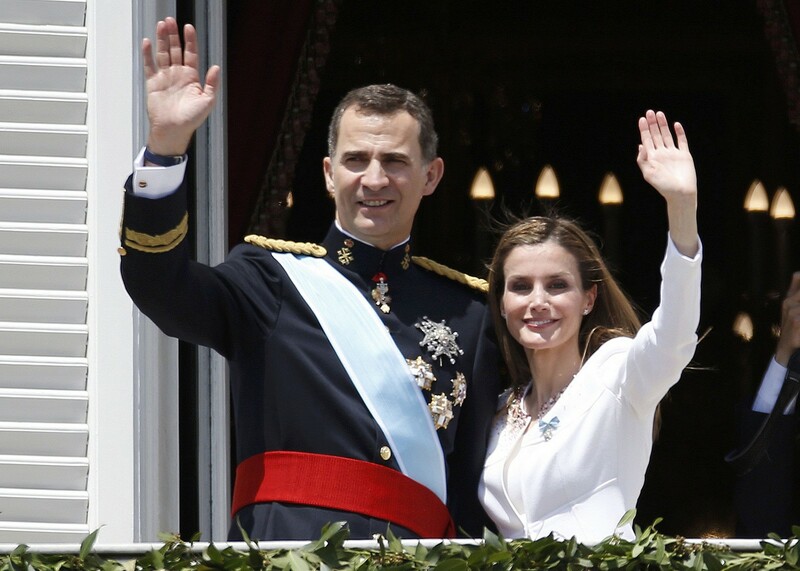 MADRID - A beaming Princess Cristina and her new husband, the six-foot six-inch Olympic athlete Inaki Undangarin, waved from an open-top Rolls-Royce to crowds of well-wishers on their wedding day on October 4, 1997. 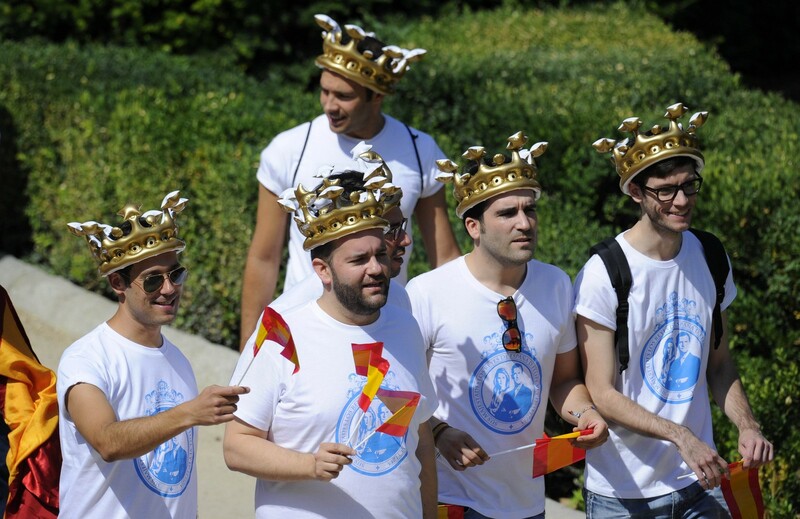 Dressed in a brilliant white designer gown and crowned with a diamond-studded tiara borrowed from her mother, then queen Sofia, the princess's wedding in Barcelona seemed to encapsulate the popularity of the Spanish monarchy. 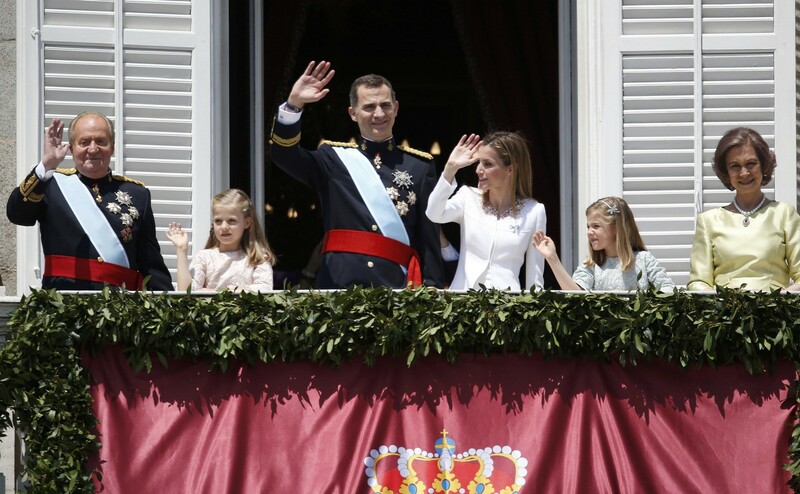 Now Cristina, one of King Felipe VI's two elder sisters, is to become the first ever member of the Spanish royal family to go on trial, in a scandal that has outraged many Spaniards and contributed to her father's abdication in June. Her fall from grace could hardly be more dramatic. 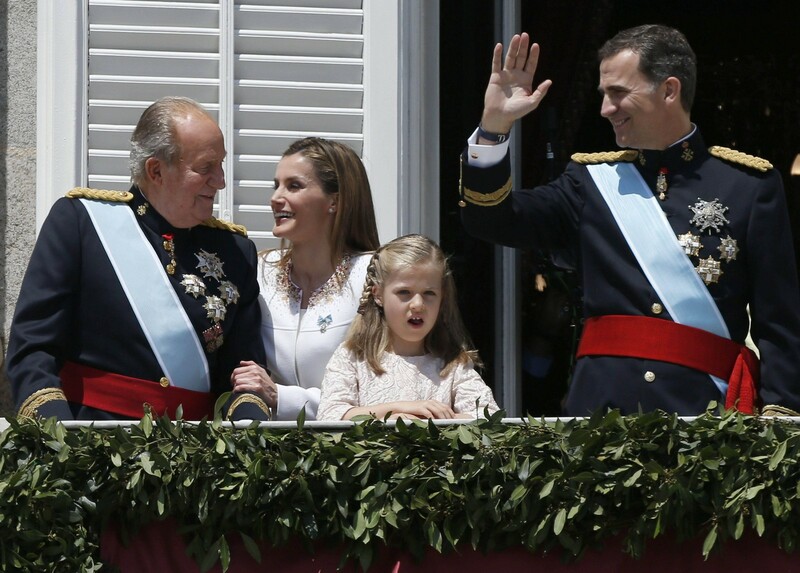 After her marriage, the Infanta Dona Cristina Federica of Bourbon and Greece, who represented Spain in the sailing team at the 1988 Olympics in Seoul, became a darling of the celebrity press and won praise for having a salaried job. Her husband, who became Duke of Palma on his marriage, was a dashing, blue-eyed sporting hero. 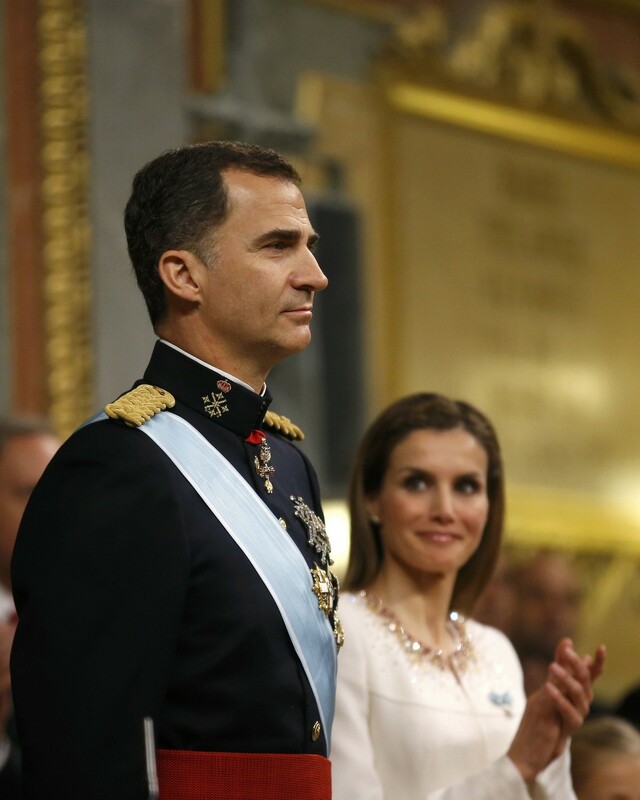 He was part of the Spanish Olympic handball team in 1992 in Barcelona and then in 1996 in Atlanta when his team won bronze and he met the princess. The team would go on to win a second bronze in 2000 in Sydney with the duke as their captain. 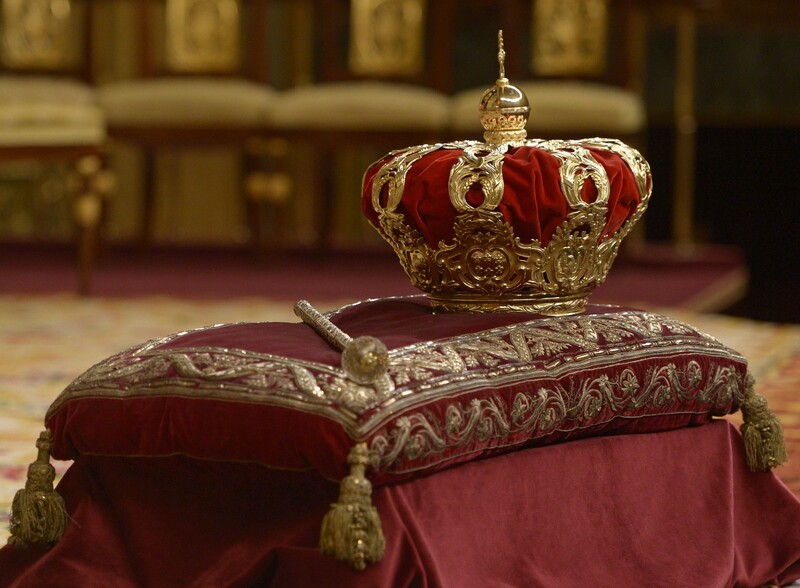 The Spanish crown is displayed before a swearing in ceremony for FelipeVI King of Spain at the Congress of Deputies, Spain's lower House in Madrid on June 19, 2014. 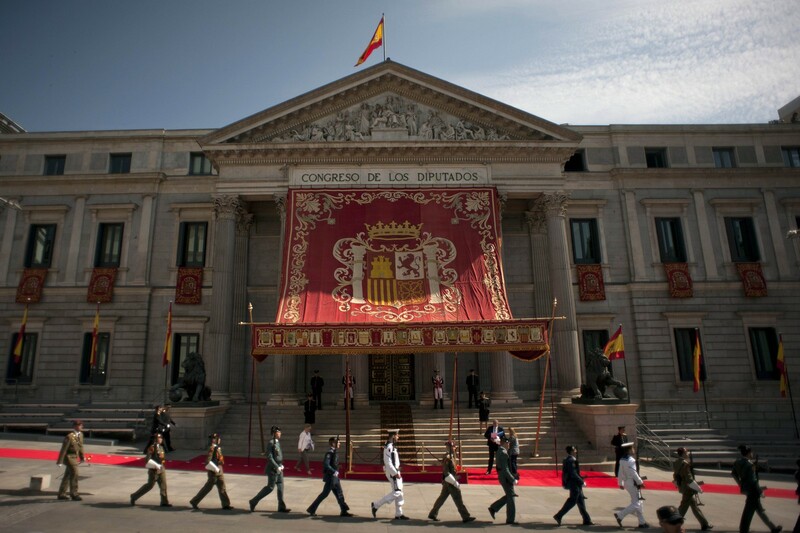 Members of the Spanish Army arrive at the Congress of Deputies, Spain's lower House, in Madrid on June 19, 2014 for a swearing in ceremony of Spain's new King before both houses of parliament. 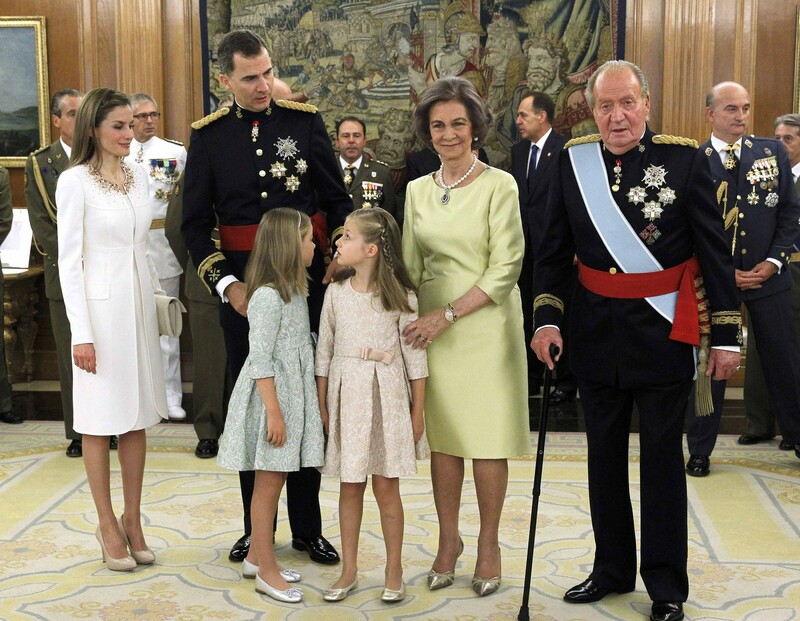 Spain's King Juan Carlos (R) and Queen Sofia (2ndR), new King Felipe VI (2ndL), her wife Queen Letizia (L), their daughters Princess Leonor and Princess Sofia pose after the Sash of Captain-General ceremony at La Zarzuela Palace in Madrid, June 19, 2014. 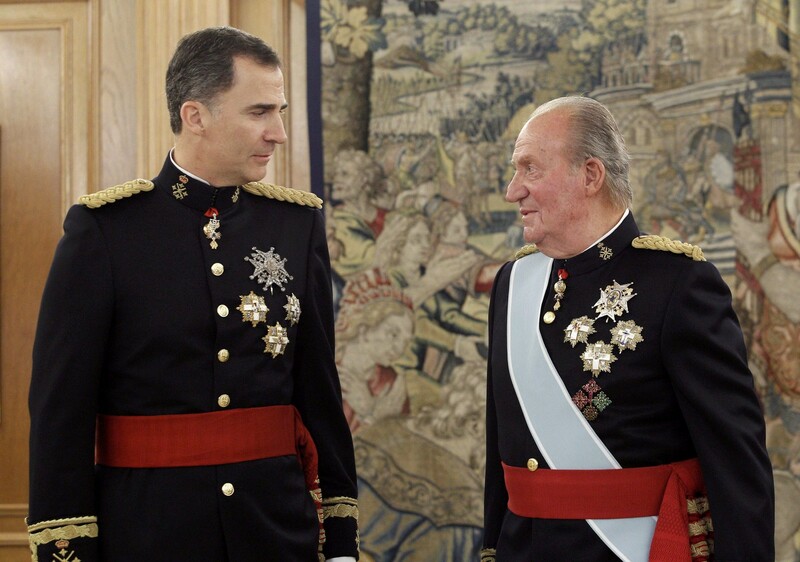 Spain's King Juan Carlos (R) and new King Felipe VI, wearing the Sash of Captain-General, attend a ceremony at La Zarzuela Palace in Madrid, June 19, 2014. 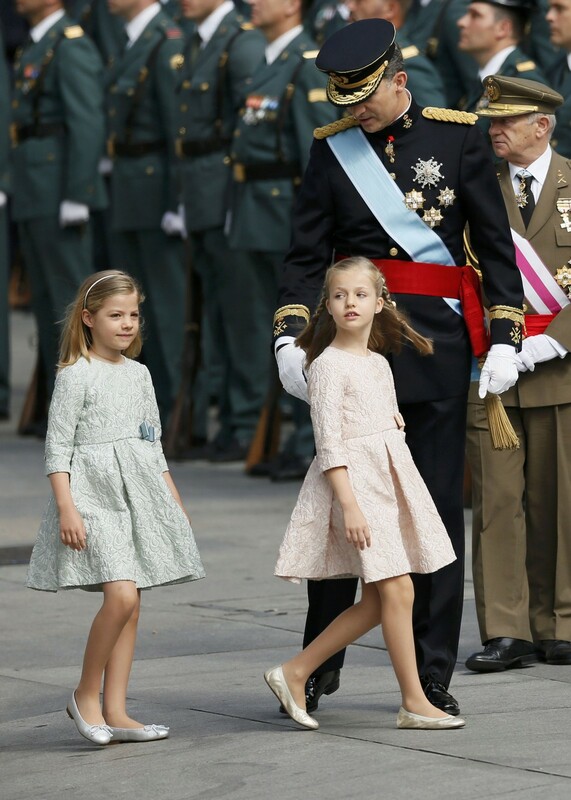 Spain's new King Felipe VI, Princess Sofia (L) and Princess Leonor arrive for the swearing-in ceremony at the Congress of Deputies in Madrid, June 19, 2014. 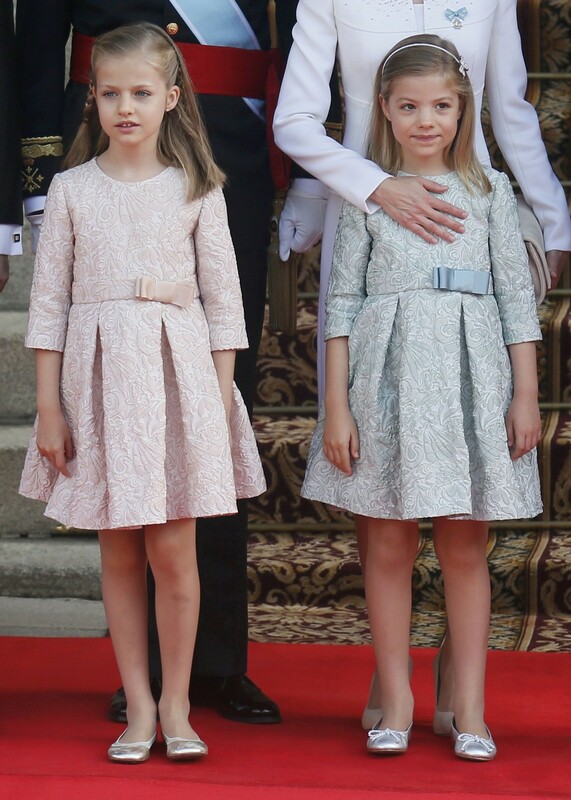 Queen Letizia (R) touches the cheek of Spain's new King Felipe VI as they sit in their car while leaving the Zarzuela Palace to the Congress of Deputies in Madrid, June 19, 2014. 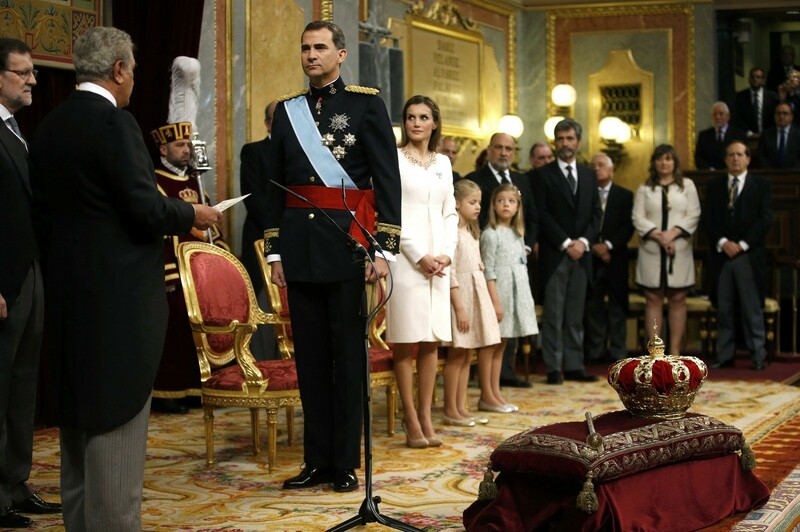 Spain's King Felipe VI (C) talks to President of the Congress of Deputies Jesus Maria Posada Moreno as Spanish Prime Minister Mariano Rajoy and Spain's Queen Letizia stand during a swearing in ceremony for FelipeVI King of Spain at the Congress of Deputies, Spain's lower House in Madrid on June 19, 2014. 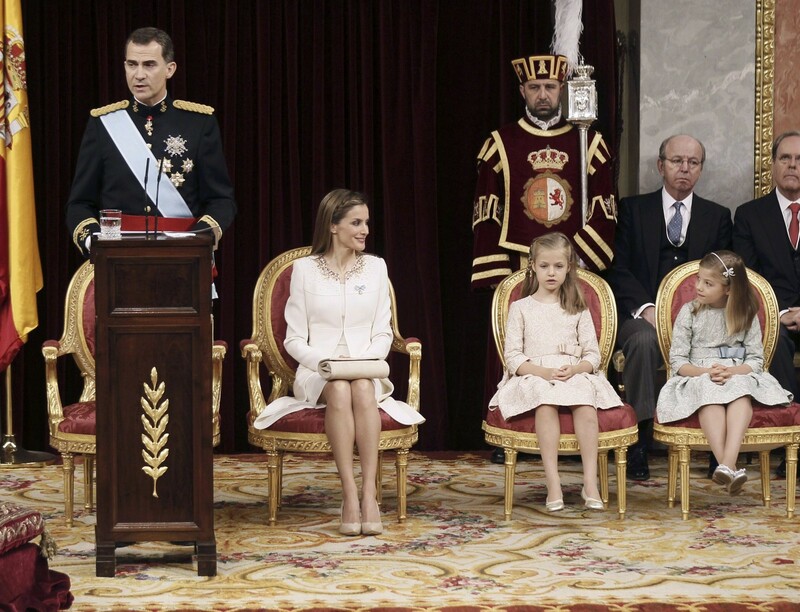 King Felipe leads a royal family tarnished by scandal after the 39-year reign of his 76-year-old father Juan Carlos, who signed his act of abdication with tears in his eyes at the Royal Palace the day before. 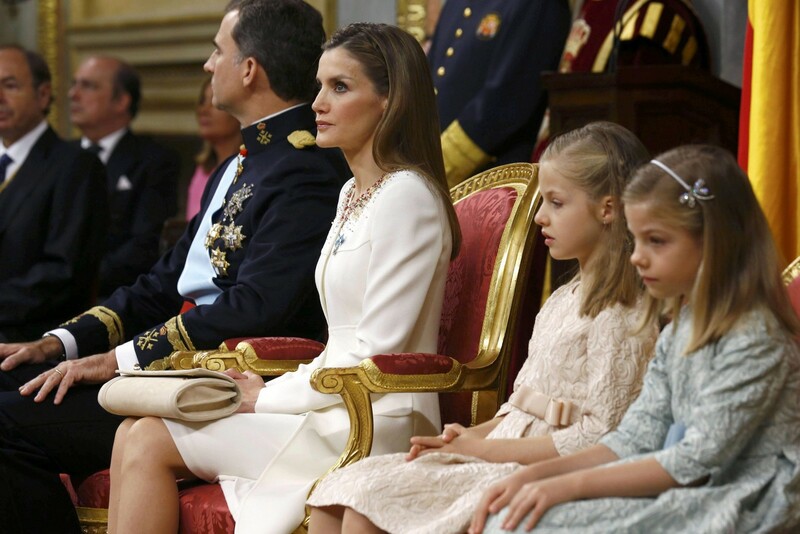 Spain's new King Felipe VI and his wife Queen Letizia (both unseen) pose with Princess Sofia and Princess Leonor (R) as they arrive for the swearing-in ceremony at the Congress of Deputies in Madrid, June 19, 2014. 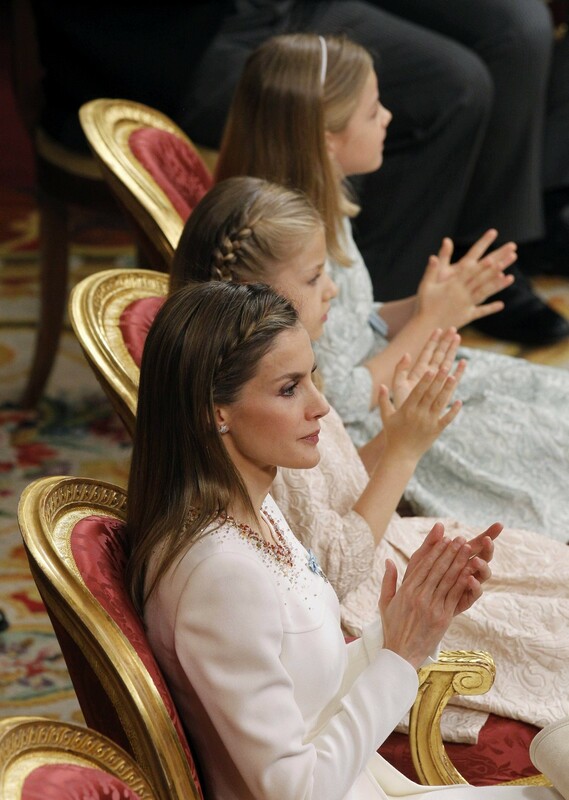 Spain's Queen Letizia sits during a swearing in ceremony for FelipeVI King of Spain at the Congress of Deputies, Spain's lower House in Madrid on June 19, 2014. 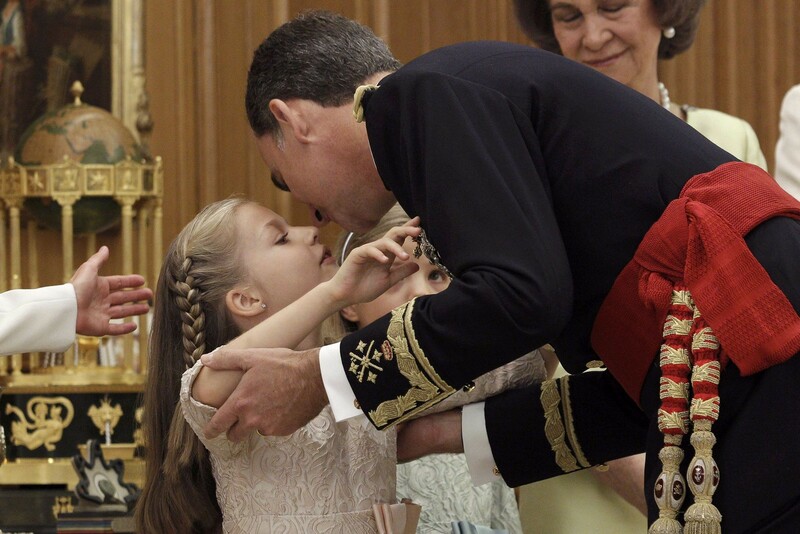 Spain's new King Felipe VI (R), wearing the Sash of Captain-General, kisses his daughter Princess Leonor during a ceremony at La Zarzuela Palace in Madrid, June 19, 2014. 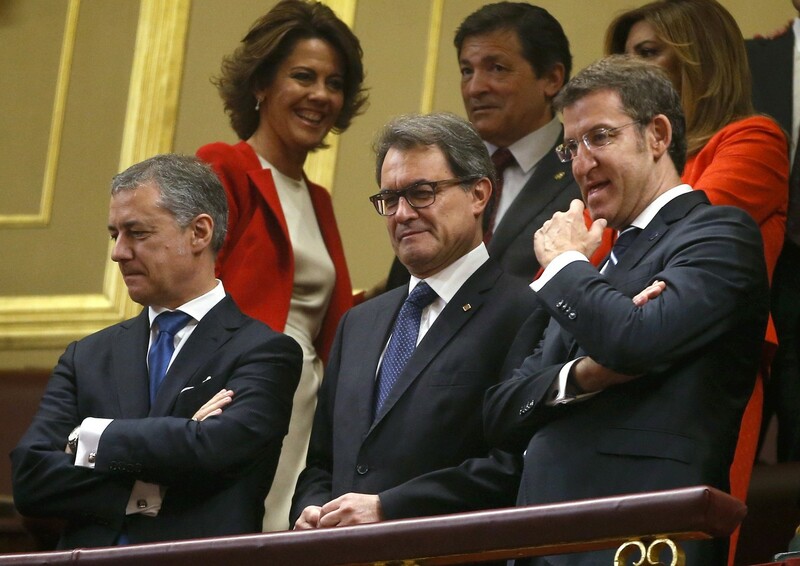 (L-R) Basque regional president Inigo Urkullu, Catalonia's president Artur Mas and Galician president Alberto Nunez Feijoo attend the swearing-in ceremony of new King Felipe VI at the Spanish parliament in Madrid, June 19, 2014. 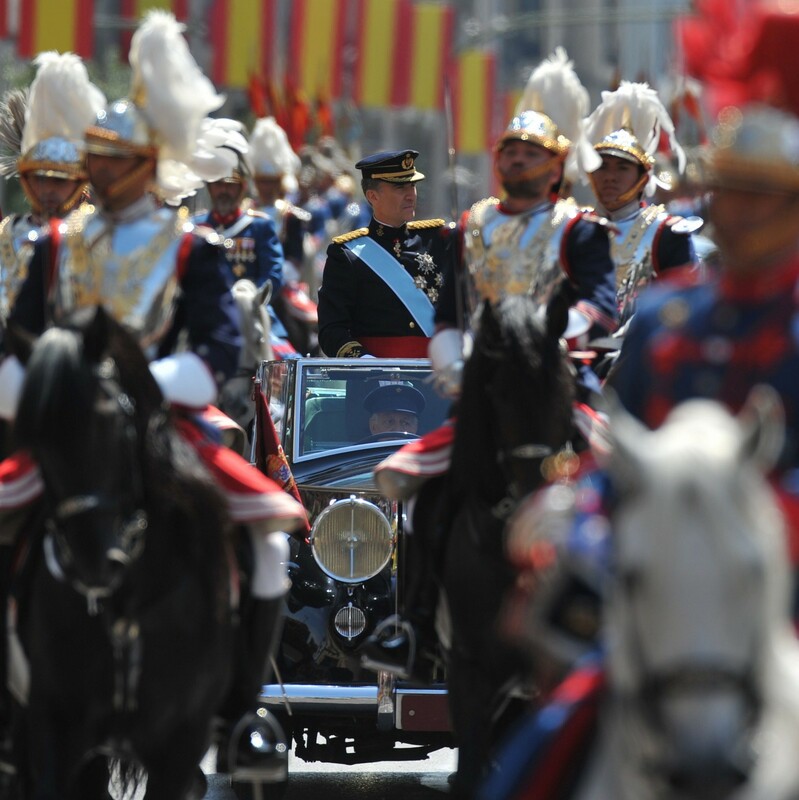 Spanish bullfighter Juan Jose Padilla walks away after greeting new King Felipe VI and Queen Letizia during a reception at the Royal Palace in Madrid, June 19, 2014. 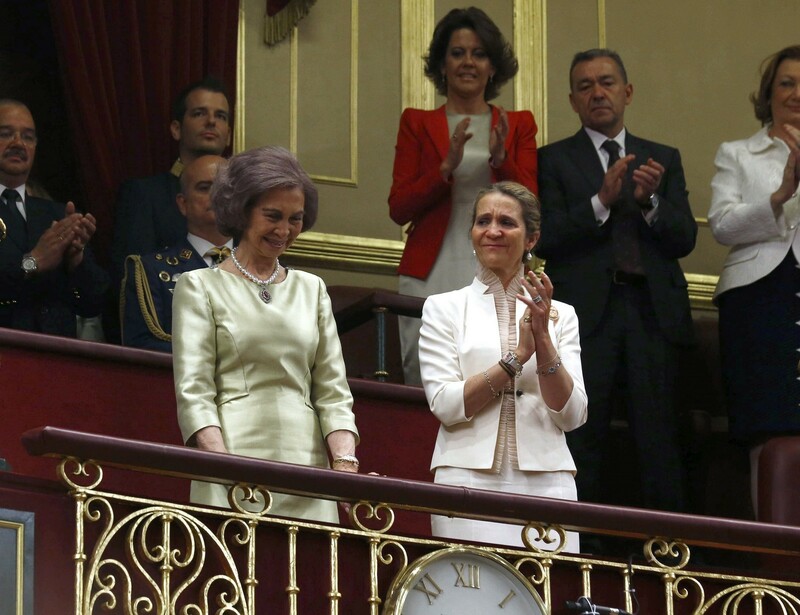 Spain's former Queen Sofia (L) smiles beside Spain's Princess Elena at the Congress of Deputies, Spain's lower House in Madrid on June 19, 2014. 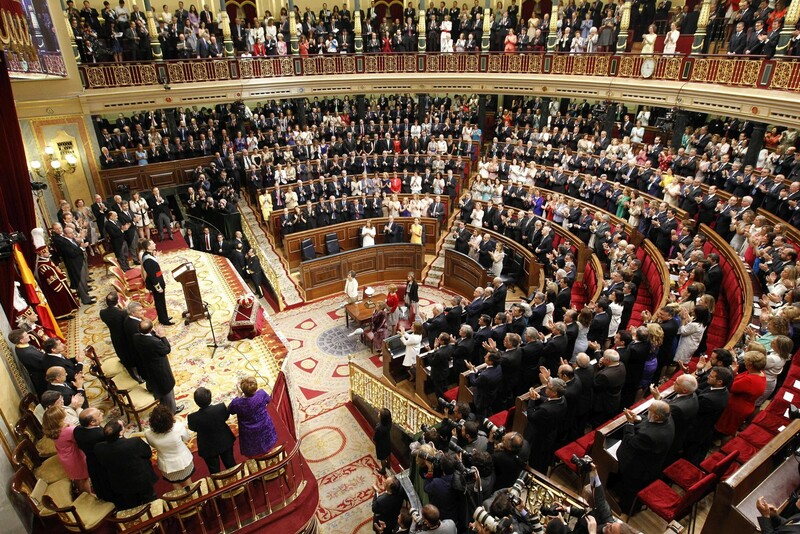 Spain's former Queen Sofia gestures at the Congress of Deputies, Spain's lower House in Madrid on June 19, 2014 for a swearing in ceremony of Spain's new King before both houses of parliament. 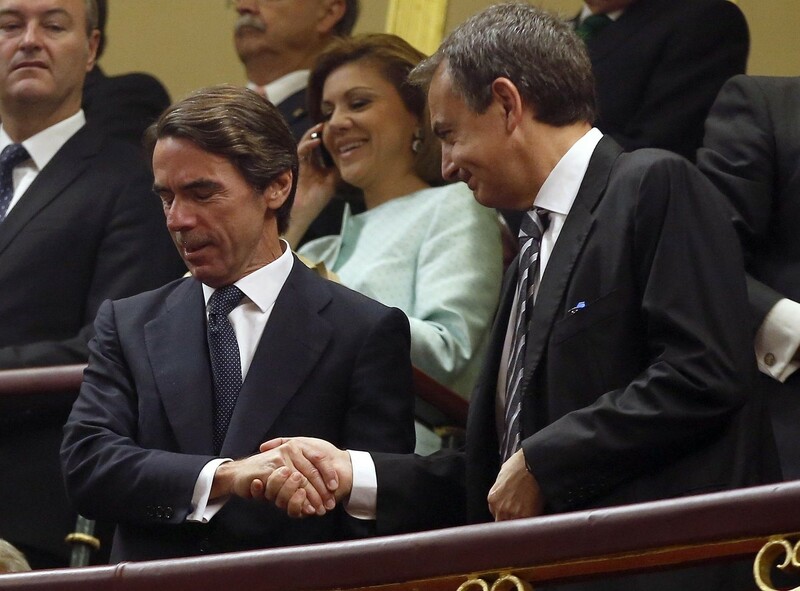 Spain's former prime ministers Jose Maria Aznar (L) and Jose Luis Rodriguez Zapatero shake hands during the swearing-in ceremony of new King Felipe VI at the Spanish parliament in Madrid. 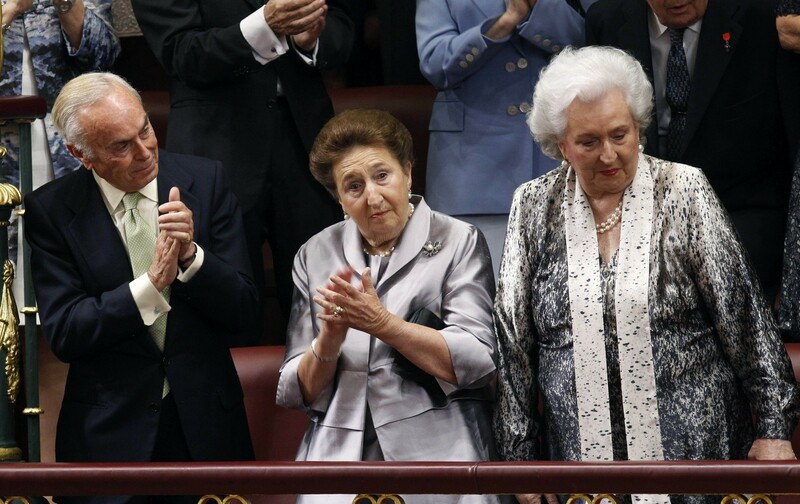 Spain's former King's sister Infanta Margarita (C) her husband Carlos Zurita and Spain's former King's sister Infanta Pilar stand at the Congress of Deputies. 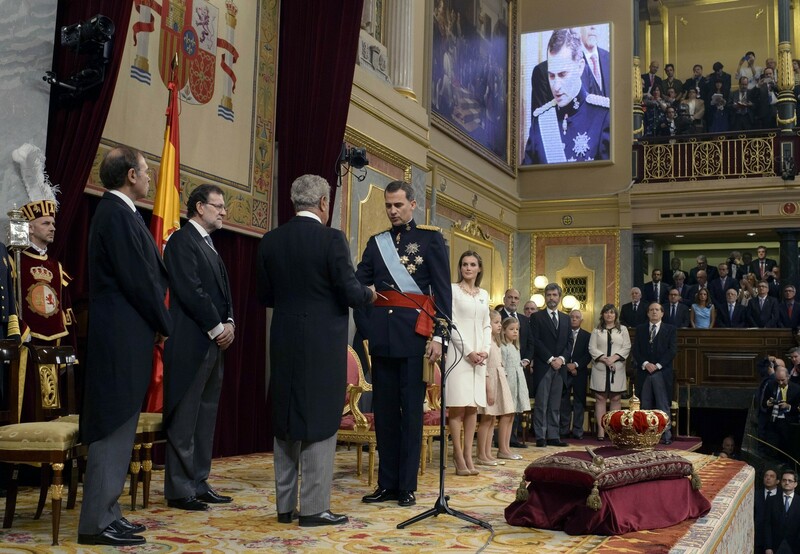 Spain's King Felipe VI is congratulated by Spain's Queen Letizia at the Congress of Deputies. 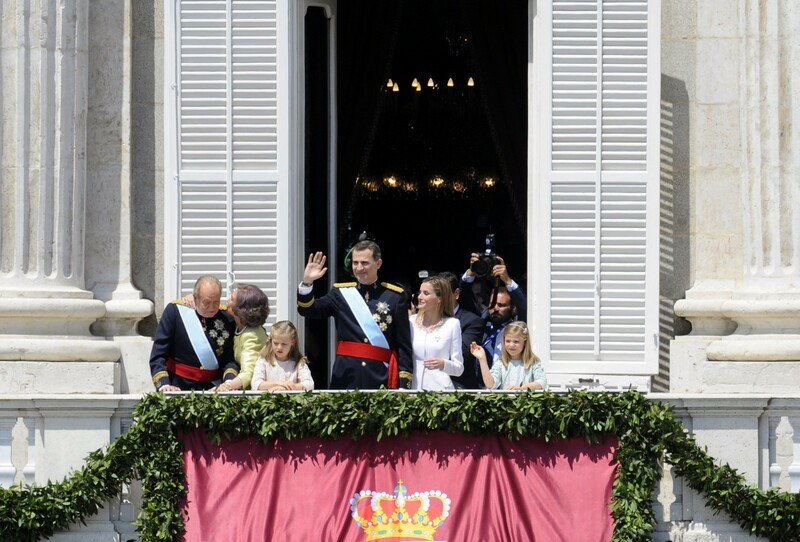 Spain's former King Juan Carlos, Spain's Queen Letizia, Spanish Crown Princess of Asturias Leonor and Spain's King Felipe VI stand on the balcony of the Palacio de Oriente or Royal Palace in Madrid on June 19, 2014 following a swearing in ceremony of Spain's new King before both houses of parliament. 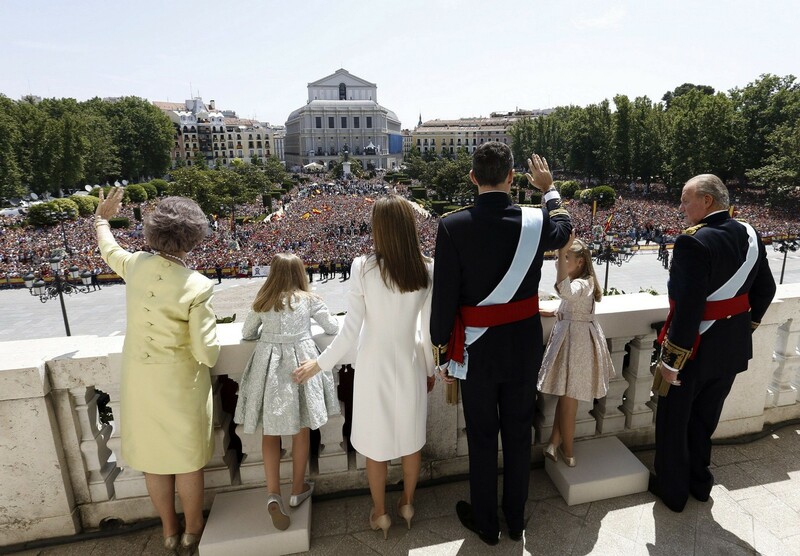 Spain's former Queen Sofia, Spanish Princess Sofia, Spain's Queen Letizia, Spain's King Felipe VI, Spanish Crown Princess of Asturias Leonor and Spain's former King Juan Carlos stand on the balcony of the Palacio de Oriente or Royal Palace in Madrid. 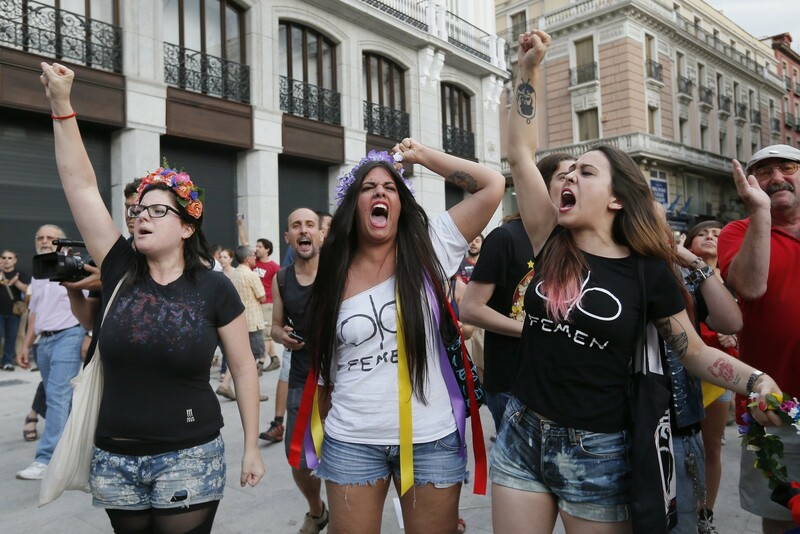 Now he must try to rally a people stricken by a 26 per cent jobless rate and strained by secessionist stirrings in the northeastern region of Catalonia, which wants an independence vote on November 9. 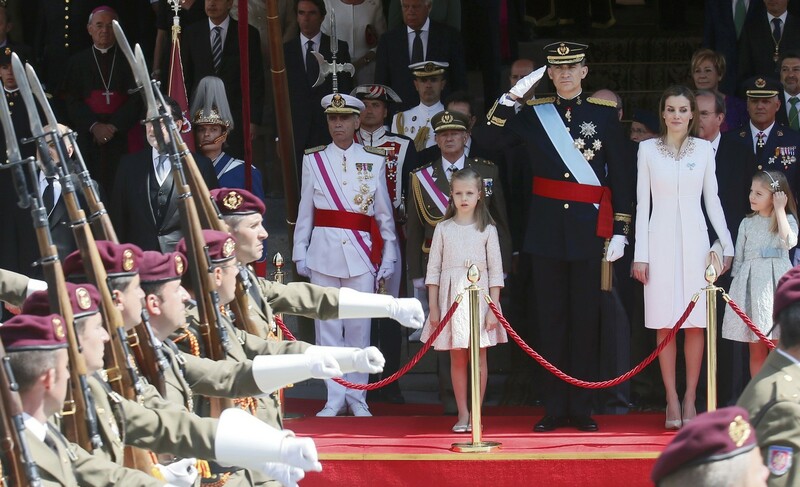 Spain's new King Felipe VI, his wife Queen Letizia, Princess Sofia and Princess Leonor stand on the stairs leading to the Puerta de los Leones to oversee a military parade in Madrid, June 19, 2014. 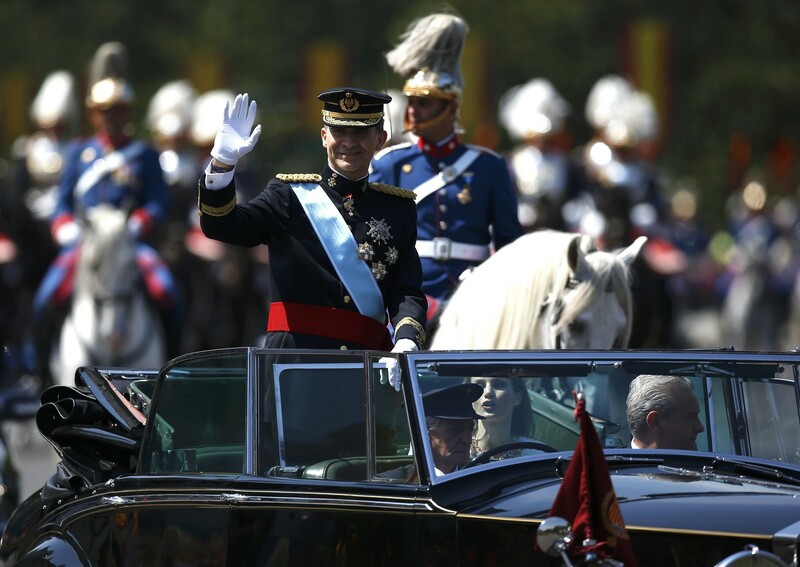 Spain's King Felipe VI waves on arrival to the Palacio de Oriente or Royal Palace in Madrid on June 19, 201. 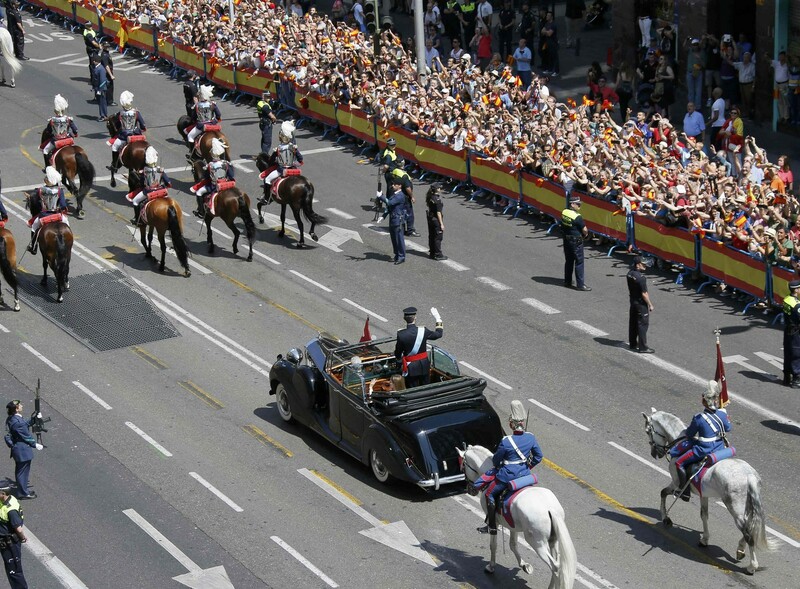 Spain's King Felipe VI begins a new reign on June 19 already facing a threat to the unity of his kingdom as the northeastern region of Catalonia fights to hold an independence referendum on November 9, 2014. 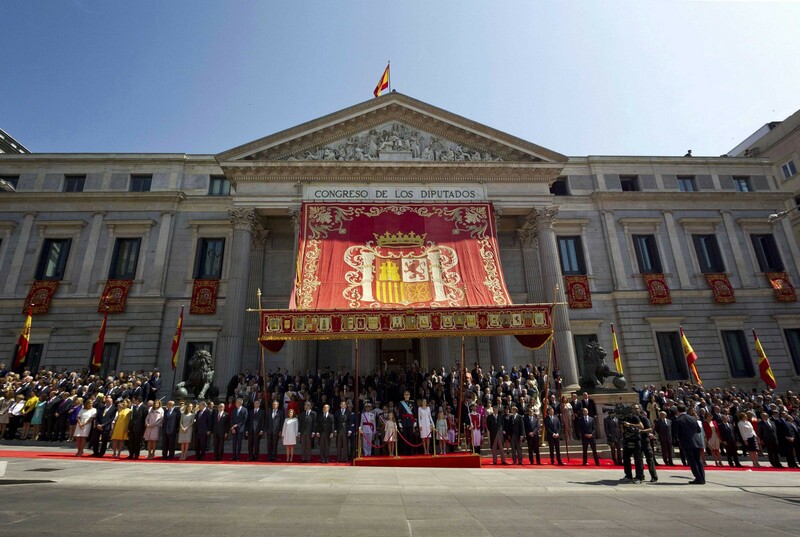 Felipe said in his proclamation speech that "the parliamentary monarchy can and must continue". 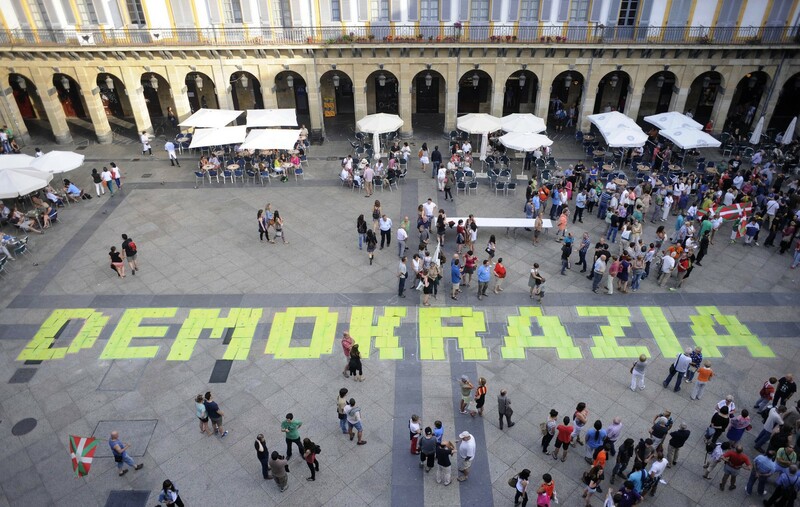 Demonstrators set on the ground a giant banner reading in Basque "Democracy" as they protest against the coronation of Spain's King Felipe VI, on June 19, 2014, in the northern Spanish Basque city of San Sebastian. 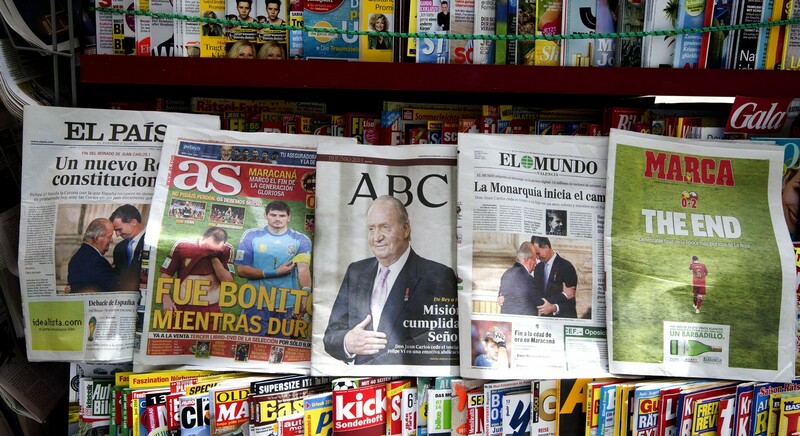 Newspaper front pages are displayed in a kiosk in Valencia on June 19, 2014. 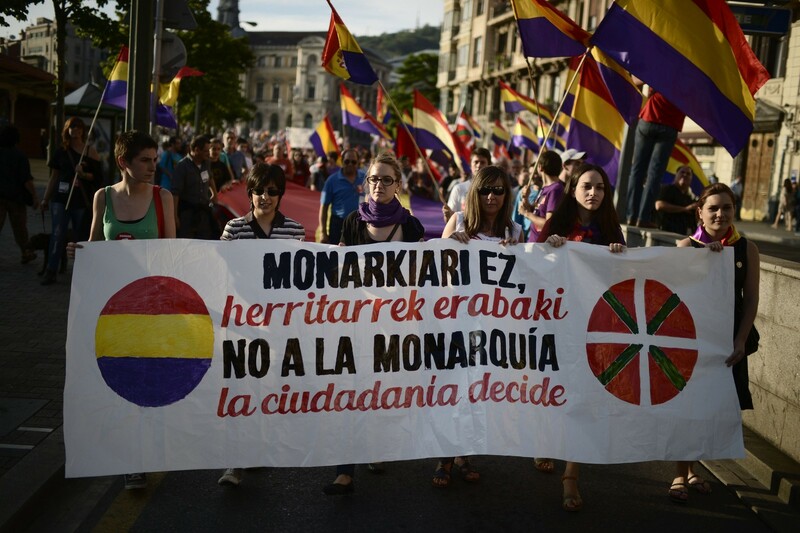 Republican demonstrators march behind a banner reading "No To The Monarchy. 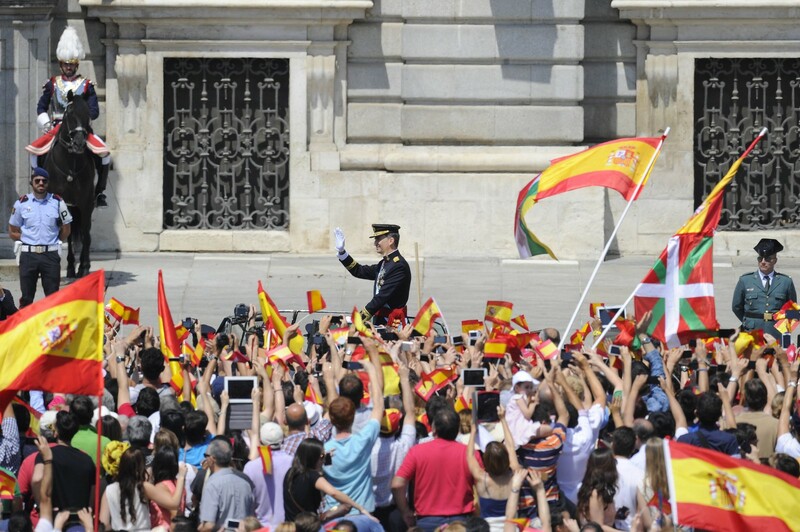 The Citizens Decide", in Bilbao June 19, 2014. 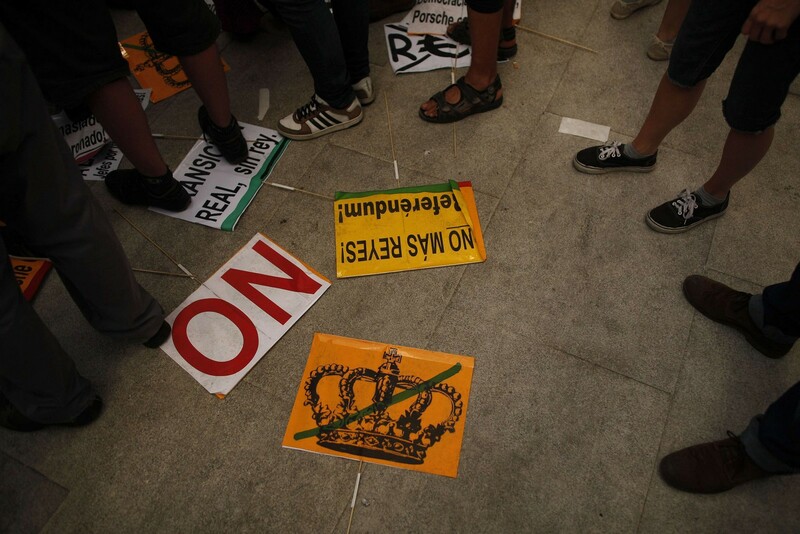 Republican demonstrators stand next to signs against monarchy during a Republican protest at Madrid's landmark Puerta del Sol square after the swearing-in ceremony of Spain's new King Felipe VI in Madrid June 19, 2014. 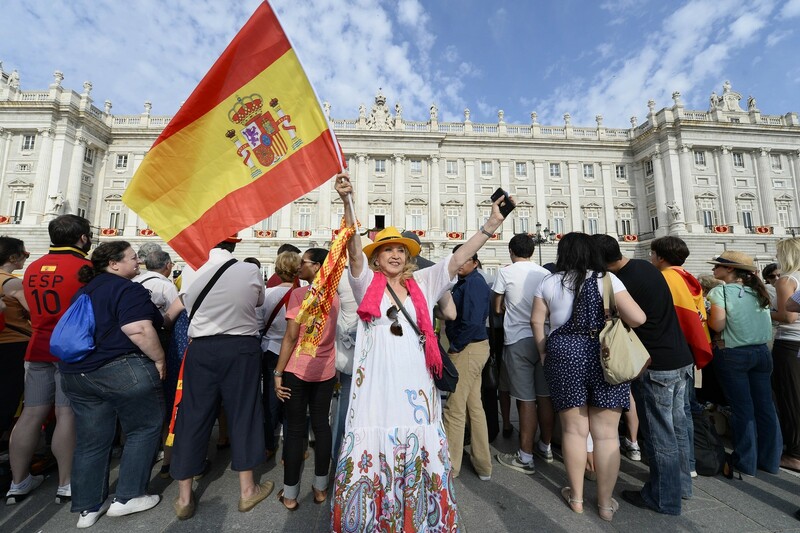 Anti-monarchy demonstrators shout slogans during a Republican protest, after the swearing-in ceremony of Spain's new King Felipe VI in Madrid, at the landmark Puerta del Sol square in Madrid June 19, 2014. 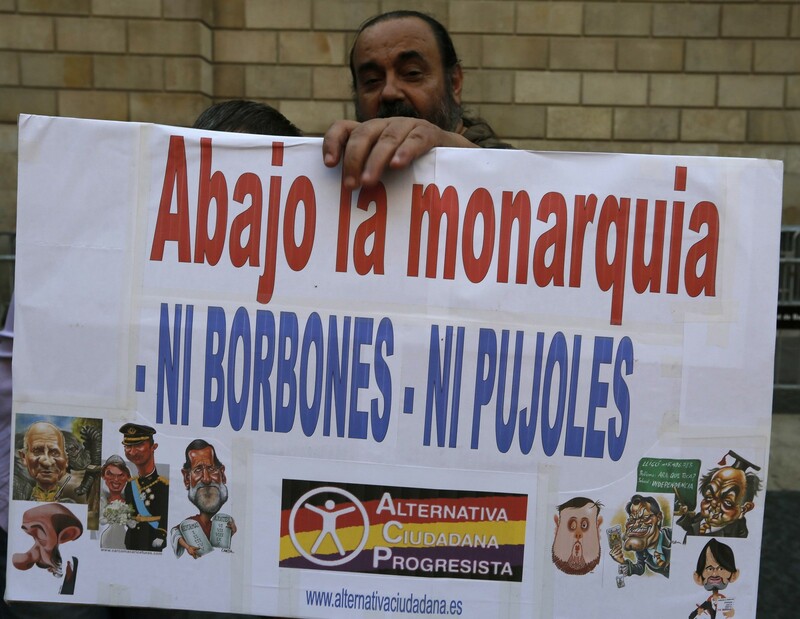 A man holds a placard which reads "Down with the monarchy, No Bourbons, No Pujoles". 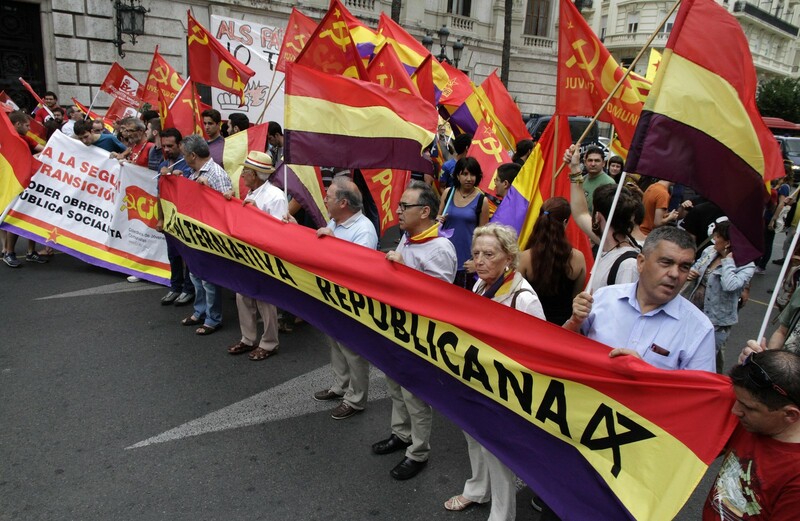 Republican demonstrators carry a Spanish Second Republic flag with text which reads "Republican Alternative". 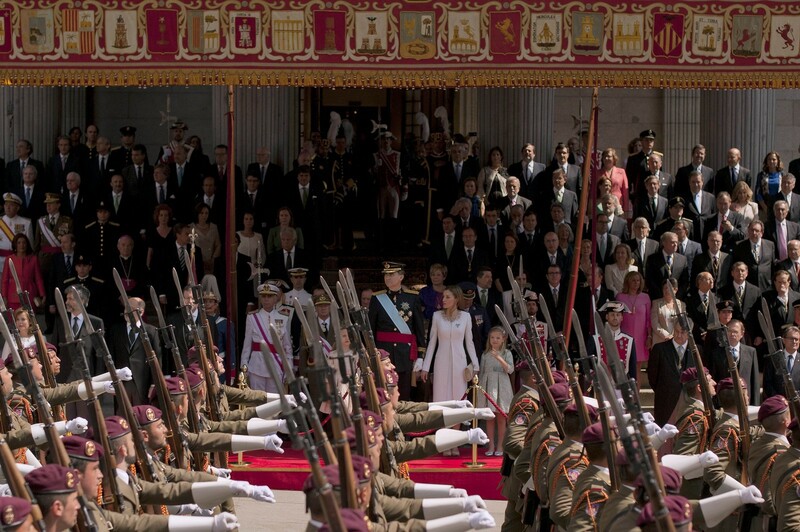 Spain's new King Felipe VI (C), his wife Queen Letizia, Princess Leonor (4thR) and Princess Sofia (R) review the troops during a military parade outside he Congress of Deputies after the swearing-in ceremony in Madrid. Cristina, 49, was still smiling even as she entered a court in Palma de Majorca in February to answer an investigating judge's questions about suspected tax dodging and money-laundering linked to 46-year-old Urdangarin's allegedly corrupt business dealings. Cristina, a married mother of four who studied in Madrid and has a masters degree in international relations from New York University, denied detailed knowledge of her husband's affairs, saying she simply trusted and loved him. 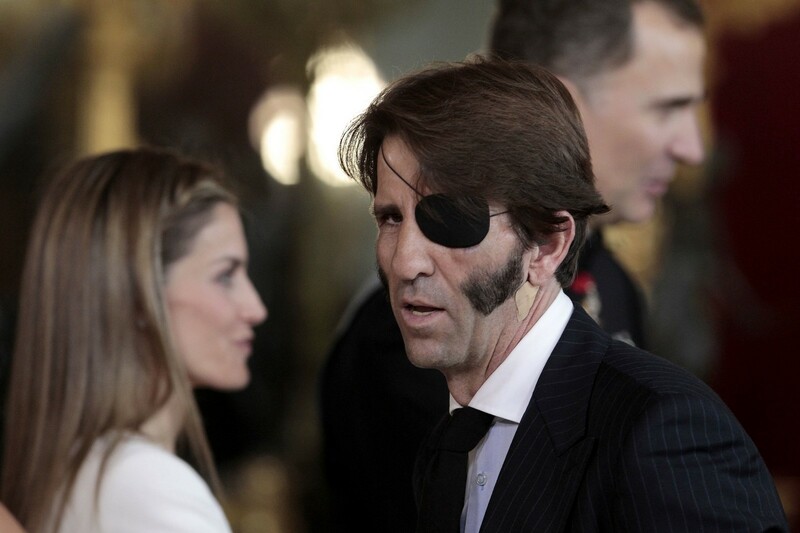 Now the judge, Jose Castro, has wrapped up his four-year investigation by ruling that Cristina must stand trial as a suspected accessory to tax fraud by her husband.